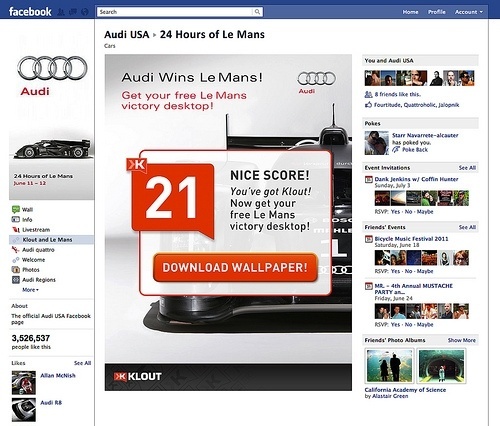 On Friday, 28 September, Klout announced that they will be supporting Facebook pages, which means that your Facebook page will also influence your Klout score. Now you can login to your Klout account and connect your company’s Facebook page so that your Facebook activity can help you boost your Klout score. Last month, Klout updated their look and revamped their scoring methods. “We went from about 100 variables that we were looking at to over 400. We went from about 100 variables that we were looking at to over 400,” Joe Feranndez, founder of Klout, told Mashable. We’re happy with this new move – Facebook is one of the biggest social networks and it definitely has an impact on your online credibility and your ability to influence others. Not only will it make it a bit easier to boost your Klout score (if you’re active on Facebook and post sharable content), but it also means that your Klout score will reflect a more complete online reputation. One of the other scoring methods that was introduced in August was the impact of “real world influence”, which basically means your title will influence your Klout score. If you’re a CEO or you’re important enough to have your own Wikipedia page, your Klout score will increase. Another cool new feature on Klout is the “Your Moments” section, which shows your more influential social media posts and tweets over the past three months. We’re going to be keeping an eye out for more changes and we’re eager to see how our Facebook page will influence our Klout score!